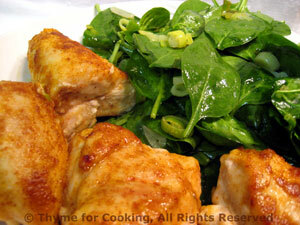 Easy Dinner from Thyme for Cooking: Lemon Chicken and Spinach Salad. We're still just nibbling at salad season, but the spinach is starting to get plentiful. Fresh lemon makes a light dressing for both the chicken and the salad, which uses my favorite spring treat: green garlic! 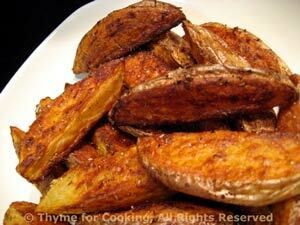 Cut in wedges and baked in the oven, these are quick, easy, and much lower in fat than traditional Fries. Put remaining ingredients into a large bowl and mix well. Add potatoes and toss, coating thoroughly. Arrange potatoes on baking sheet with rim (I use my trusty, round pizza pan). Bake at 400F for 30 minutes. When done remove from pan and sprinkle lightly with salt and pepper if you choose (again, I don't) and serve. These will stay hot for awhile so a 5 or 10 minute delay is okay.